Good definition of a Pull production system. What Is main Difference between a Push and Pull production system? Hopp, Wallace J., and Mark L. Spearman. 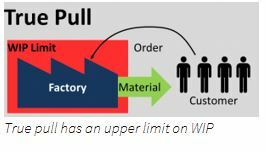 “To Pull or Not to Pull: What Is the Question?” Manufacturing & Service Operations Management 6, No. 2 (April 1, 2004): 133–48. doi:10.1287/msom.1030.0028. ← Ronald Fisher and Karl Pearson the Grandfathers of Six Sigma !